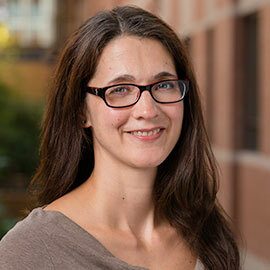 WATERLOO – Wilfrid Laurier University psychology Professor Anne Wilson has been appointed as a Fellow in the Canadian Institute for Advanced Research (CIFAR) Successful Societies program. As a member of the program, Wilson joins other leading academics from sociology, political science, political philosophy, history and economics, who are interested in addressing societal inequalities. Wilson works in the area of personal and social identity (including gender, ethnicity, nationality and religion) across time. She examines how people remember the past and think about the future, and how these perspectives affect their understanding of the present. Through her work, she has discovered that groups often have very different perspectives on the same historical injustices; what one group may perceive as painfully recent another might view as ancient history. These divergent perceptions of time are often motivated by their desire to see one’s own group in a positive light. Her research will explore how a group’s representation of their history can inform their understanding of inequality today. Wilson is a professor in the Department of Psychology at Laurier and currently holds a Canada Research chair in Social Psychology (Tier II). She is a member of the College of New Scholars, Artists, and Scientists at the Royal Society of Canada. Her research has been supported by the Social Sciences and Humanities Research Council and the Canadian Foundation for Innovation. Successful societies are those that create conditions that lead to better health, well-being and resilience for individuals and communities. The Successful Societies program aims to identify the cultural and social frameworks that put societies on a path toward greater and more equitable prosperity. It looks beyond simple economic analysis, and examines how an individual’s sense of identity and belonging within a culture can affect overall economic, physical and psychological well-being. The program bridges the gap between researchers interested in studying institutions and those who study culture. The cross-pollination of ideas allows researchers to get a broader sense of how to address issues in the bigger picture.